Optical spectra of the BNS merger event GW170817. 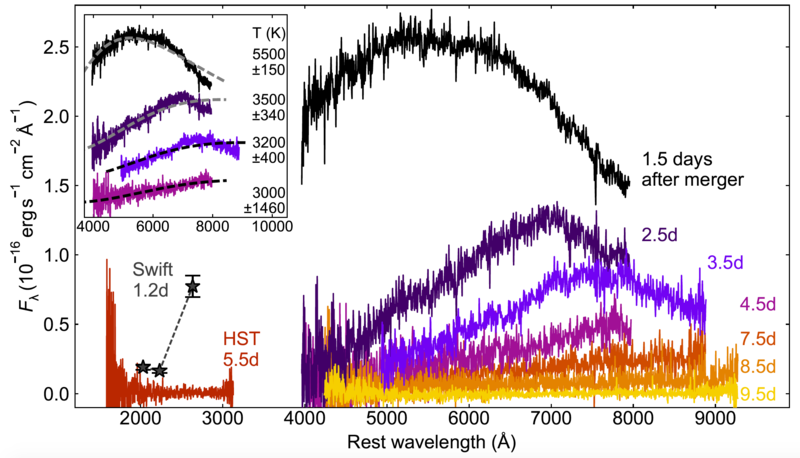 We use optical spectra from the SOAR and Magellan telescopes, and an ultraviolet spectrum from the Hubble Space Telescope, to investigate the properties of the kilonova associated with GW170817. The spectrum of GW170817 shows a distinct optical bump matching the predictions of models for ‘blue’ or lanthanide-poor kilonovae. Very high velocities (about one-third the speed of light) are needed to explain the lack of resolved spectral lines: any lines must be smeared out through Doppler broadening. To reach such speeds, the most likely scenario is that the polar matter was ejected by strong shocks at the point of collision, rather than delayed ejection from an accretion disk around the merger remnant. This requires that both members of the binary were neutron stars, rather than black holes (such scenarios are difficult to discriminate between using gravitational waves alone). The large mass of blue material (0.03 times the mass of the Sun) suggests the neutron stars are compact (radius less than 12 km).